The final result of this extensive research is the HandshoeMouse - "The Only Mouse That Fits Like a Glove". The studies which were undertaken at Erasmus strongly suggested that actual physical issues commonly reported by computer operators are often associated with gripping and pinching the mouse which is also referred to as Static Grip Force. The vast majority of computer mice currently produced are too small for the hands of most users. This results in a requirement to grip and pinch the mouse in an awkward manner in order to move and control the mouse. The majority of users are often unaware of how they hold the mouse but if observed this is a very common problem. 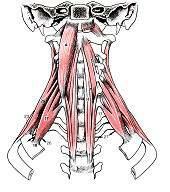 This action can result in tension in the deep neck muscles (see image on the left) which can lead to restrictions that can result in pressure on nerves, arteries and veins with a potential to restrict blood flow in the arms and hands. *Note: Complaints may also increase as a result of stress. The Erasmus researchers also came to the conclusion that when utilizing a traditional computer mouse, users are required to almost continually exert upward force on the fingers in an effort to avoid inadvertent clicking. 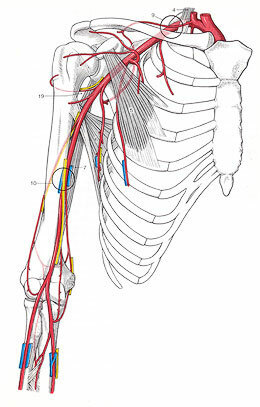 This hovering can lead to overexertion of the extensor muscles in the arm and hand. This overexertion can trigger tension in the deep neck muscles, greatly increasing the risk of Thoracic Outlet Syndrome and associated complications as a result of the constriction of the costoclavicular gate (see image to right) between the first rib and the clavicular bone. Researchers also considered the "highly intense use of fingers", an issue addressed by Profession Van Zwieten of Hasselt University in Belgium i.e. overuse which has proven to lead to hand or finger complaints. In order to fully comprehend this issue?, researchers analyzed some of the joints through functional anatomical research. This research determined that the fingers require "support" or "stabilization" in order to reduce the risk of disorders commonly associated with computer mouse usage. Pronation of the forearm occurs when the Radius crosses over the Ulna. This occurs repeatedly when using a traditional mouse or keyboard as the rotation of the hand until it is facedown to the mousing surface "twists" the two bones over each other. While the pronation of the forearm is one possible source of complaint, studies may also indicate that the neutral position which mice with a more vertical orientation provide results in a state of tension in the forearm in the interosseous membrane which sits between the Ulna and Radius bones. Since the muscles which provide movement to the thumb and index finger in general are attached to this membrane the gripping action that is required by some designs can add increased tension to this already taut membrane. (for publication click here.) This short one minute video regarding mouse movement addresses the above concern. Studies conducted by the National Taiwan University and at Erasmus Univeristy Medical Center indicate that a "slightly slanted" mouse body is more desirable in order to prevent the issues commonly associated with mouse usage.